" I did a lot of comparison shopping and found CoffeeCakes had the best prices. My order arrived complete and fast. I would recommend CoffeeCakes to anyone and I will shop there again." Buy 2 of our best selling cakes and get 2nd cake half price! This is a cake lovers dream! Excellent value buy two of our best selling coffee cakes get the second cake for half price! Cakes must be mailed to the same address, this offer does not cover cakes going to two separate addresses. Select any two CoffeeCakes.com Signature Coffee Cakes. Selections include Traditional Cinnamon Walnut Coffee Cake, Apple Walnut Coffee Cake,Blueberry Coffee Cake, Chocolate Walnut Coffee Cake, Lower Fat Cinnamon Walnut Coffee Cake and No Walnut Cinnamon Coffee Cake. Cakes stay fresh on the counter for a week or can be frozen up to four months. These cakes are trans fat free and do not contain any artificial coloring, artificial flavoring or preservatives and make great gifts for giving and entertaining. Fresh New England blueberries and pure New England maple syrup are mixed into the traditional rich sour cream coffee cake batter. Walnuts are not added to this popular blueberry coffeecake. The apple doesn't fall far from the tree with this cake! CoffeeCakes.com Apple Walnut Coffee Cake uses a traditional rich sour cream coffeecake batter enriched with two layers of fresh granny smith apples. The coffee cake is then slow-baked in order to caramelize the apples. More than a collection of products our Corporate Gift Giving Program provides are full service program featuring our exceptional customer service. 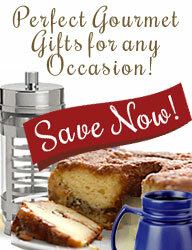 We are a gourmet gift internet retailer, we do not sell our products wholesale or for re-sale. Although, we do offer a very generous corporate gift program for our customers wanting to give our wonderful gourmet products as gifts.